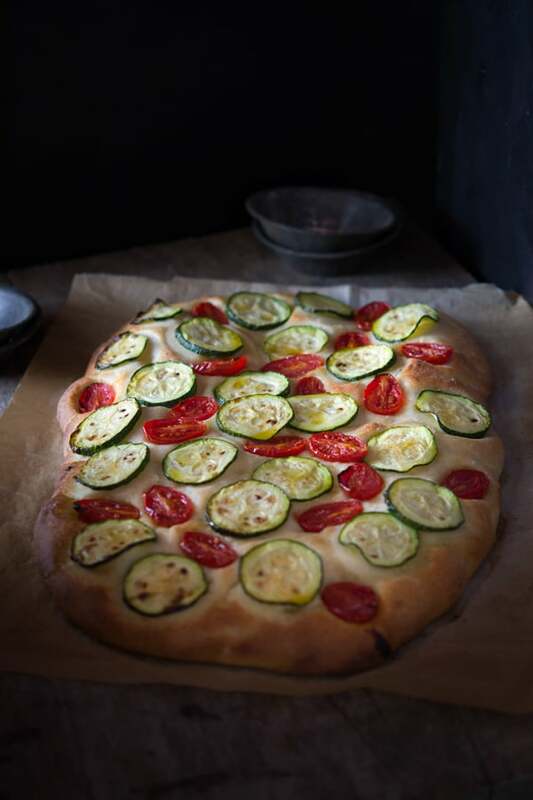 Zucchini and roasted tomato focaccia, simple, delicious and perfect for sharing. A great way to use up Summer veggies. 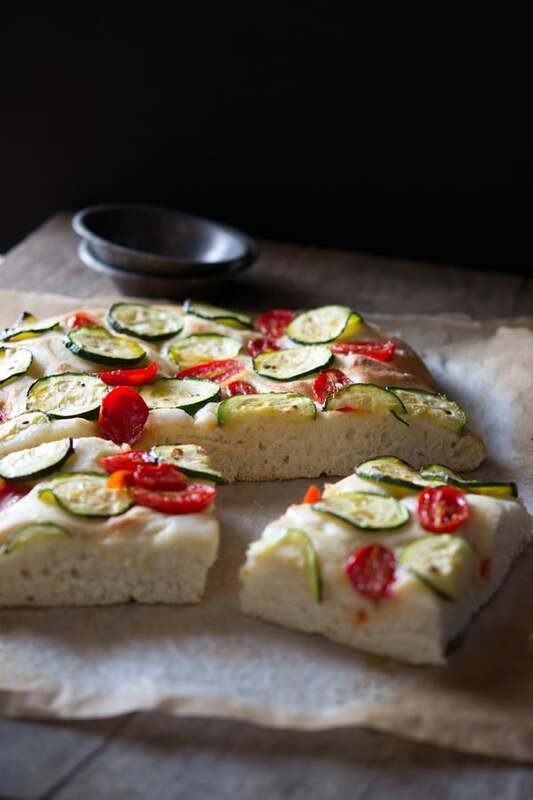 This homemade zucchini and tomato focaccia is made with a soft light and fluffy dough, fresh cherry tomatoes and zucchini rounds. Focaccia is a great thing to know how to make. You can leave the dough for as little as one hour (longer if possible) and top it with whatever you like or have in your fridge. It makes a great snack, appetizer or side. I often make a focaccia to have along side a bowl of pasta (my boyfriend needs a lot of food) or when I’m making an antipasto platter to go with drinks. I see a lot of vegetable focaccia in bars, delis and bakeries around Italy. Bell peppers, aubergine (eggplant), zucchini, onions and tomatoes are the popular choices. 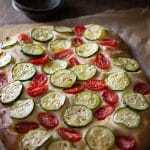 For this focaccia I chose a simple combo of zucchini and sweet cherry tomatoes. After the focaccia has been baked there’s a delicious, salty, crispy crust around the edges and a soft, light and fluffy middle. You can choose the thickness of your focaccia according to your preference, I like quite a thick focaccia that’s about 3-4mm before going in the oven. You might also like my rosemary focaccia with mozzarella it’s simple, cheesy and delicious. Add the yeast and sugar to the warm water and set aside for 5 minutes. Add the flour and tsp of salt to a large bowl and make a well in the middle. Pour the yeasty water with 1/2 tbsp of olive oil to the flour and mix until it starts to form a dough. Lightly dust a clean work surface with flour and knead the dough for 10 minutes. When you lightly press your finger on the dough it should spring back up, that's when you know it's ready. It should be smooth and soft. Shape the dough into a ball then place in a large bowl that's lightly oiled in olive oil. Rub the top of the dough very lightly with olive oil and then cover the bowl with clingfilm or a damp tea towel. Store in a warm place for 1 hour or preferably for around 3 hours until it's doubled in size. Preheat the oven to 220°C/425F/gas mark 7. Very thinly slice the zucchini and cut the tomatoes in half. Knock back the dough and place on a lined baking tray. Press the foccacia with your fingers to flatten it out onto the tray creating small dimples as you go. drizzle with 1/2 tbsp olive oil and rub all over. 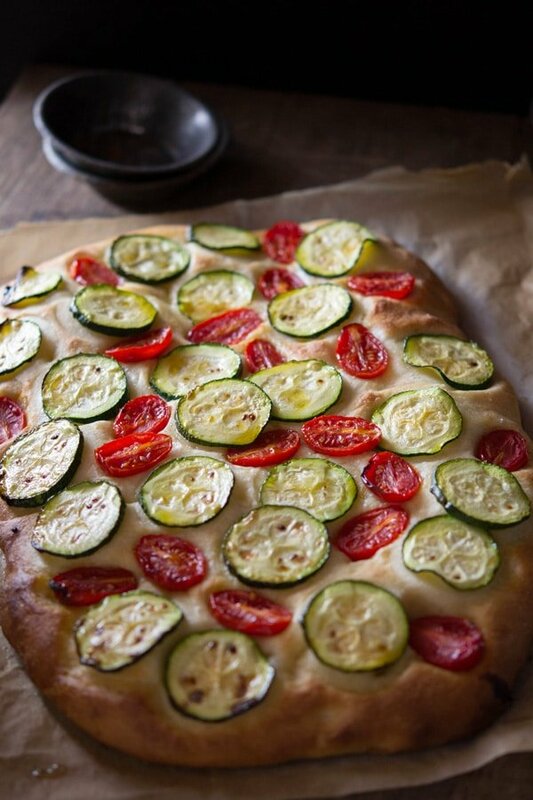 Arrange the slices of zucchini and tomatoes all over the focaccia, pressing the tomatoes in slightly. drizzle again with a little olive oil and rub over the vegetables. Bake for 10-15 minutes until golden brown around the edges, sprinkle with a little salt and pepper and let it rest for 5 minutes before cutting into slices. I like this!! I love zucchini and I got a bunch I need to use. YUM!!!!!! At first thought, I wondered if the tomatoes would make this bread soggy but I like the way you used them. It looks delicious! I could also see adding rosemary to this bread, too. YUMMY! Focaccia is one of my favorite things and I love how you’ve added some veggies to the top. I am looking forward to making this. Hopefully tonight! Love this, summer produce is so good right now, and I’m not ready to start thinking about pumpkin just yet! I’ve tried this focaccia before, and it was actually much better the second day once the flavors had a chance to meld–very pizza-like. And it reheated very nicely too, with a little extra crispiness. Thanks for sharing.